A day over one week ago I posted about my disappointment in our inability to negotiate a satisfactory agreement on a home that we were interested in buying. The home seemed the perfect rental situation for Jacob and the girls. The house was in good condition and the timing on the purchase seemed perfect – everything just felt ‘right’ . . . except that we couldn’t come to agreement with the sellers. We were definitely disappointed, but chose to trust God – to trust that He knew better than we could possibly know the best situation for us and for Jacob and the girls. Late Friday night we saw a new posting for a home. This home is in the same neighborhood as the one upon which we couldn’t reach agreement. It is on a quiet cul-de-sac one house removed from the walking path that leads to each of the schools in town. The home is in pristine condition and includes all appliances, the refrigerator with ice maker, and the washer and dryer. It has been recently painted inside and out and has a garden planted in raised beds with drip irrigation. 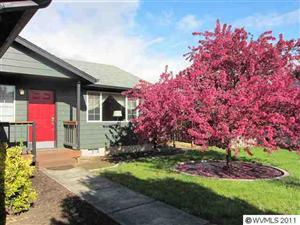 And, a relatively minor thing, but of major import to me – it has a healthy, lovely crabapple tree in the front yard. We arranged to see it the next day and loved it. Unfortunately we heard through our Realtor that the owner was firm on his price. Because of that we decided not to make an offer, but to watch both homes in that neighborhood for a period of time. On Sunday our Realtor contacted us to say that the owner had decided that he would consider a lower offer with no concessions. On Monday we decided to go ahead and submit a bid on the home. On Tuesday afternoon with very little negotiation we entered into an agreement with the owner at a price that is significantly lower than the price on the previous home. All of this came to pass within less than one week of our disappointment. When I saw that crabapple tree I was moved to tears. From the time Becky was about 2 years old until she was a bit over 7 years old we lived in Tulsa, Oklahoma. Kristin, Becky and Joni loved to play in our fenced backyard and one of the primary shade trees in that yard was a beautiful, old crabapple tree. We enjoyed crabapple jelly from that tree for several years. Since then the girls and I are on alert for crabapples wherever we go and Kristin has made several batches of that marvelous jelly. For some reason seeing that tree smack dab in the middle of the front yard was like a beautiful bow on God’s gift to us. Now every time I make crabapple jelly I will rejoice in memories – of a delightful past with our girls and of a delightful provision from our Father who knows best. Admittedly we aren’t quite there yet – we still have a few hoops to jump through and we’re still willing for the door to be closed, but regardless of the final outcome this experience has increased my ability to trust God to provide and to provide the best. This entry was posted in Grief and tagged Becky, crabapple, disappointment, faith, Father, Father knows best, grief, home, house, provision. Bookmark the permalink. Everytime I am willing to hold *insert current circumstance here* in an open palm, willing to let God leave it or take it away, I have ALWAYS experienced great blessing as a result. And the experience is ALWAYS a huge faith builder. Yes, Yes, Yes!!! Awesome. Wonderful. May God bless Jacob and the girls in this new home. Thank you Lord. Again, you provided above and beyond. PS. My mom made wonderful crabapple jelly when we were growing up in Vermont. Yummy memories. Now your little granddaughters will know that same sweet taste that their mom knew. Bless you. What an awesome story! And don’t forget the crabapples in our front yard in Salt Lake City when WE were kids…. Oh yeah!! I’ll never forget those!